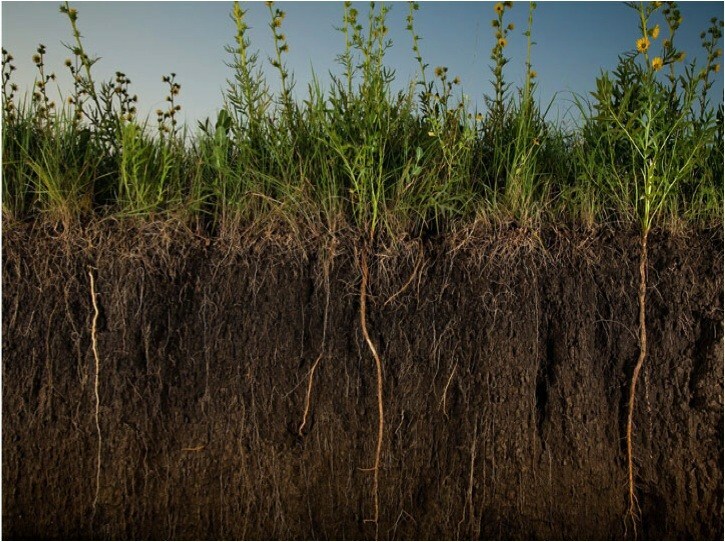 Soil is the second biggest reservoir of carbon on the planet, next to the oceans. It holds four times more carbon than all the plants and trees in the world. But human activity like deforestation and industrial farming – with its intensive ploughing, monoculture and heavy use of chemical fertilizers and pesticides – is ruining our soils at breakneck speed, killing the organic materials that they contain. Now 40% of agricultural soil is classed as “degraded” or “seriously degraded”. In fact, industrial farming has so damaged our soils that a third of the world’s farmland has been destroyed in the past four decades. There is, however, a solution. Scientists and farmers around the world are pointing out that we can regenerate degraded soils by switching from intensive industrial farming to more ecological methods – not just organic fertilizer, but also no-tillage, composting, and crop rotation. Here’s the brilliant part: as the soils recover, they not only regain their capacity to hold CO2, they begin to actively pull additional CO2 out of the atmosphere. Yet despite having the evidence on their side, proponents of regenerative farming – like the international farmers’ association La Via Campesina – are fighting an uphill battle. The multinational corporations that run the industrial food system seem to be dead set against it because it threatens their monopoly power – power that relies on seeds linked to patented chemical fertilizers and pesticides. They are well aware that their methods are causing climate change, but they insist that it’s a necessary evil: if we want to feed the world’s growing population, we don’t have a choice – it’s the only way to secure high yields. NOTE: A different version of this piece appeared in The Guardian, September 10, 2016. The carbon emissions must be controlled by taking appropriate measures against pollution and protection of environment. The government should try to see that uncontrolled industrialisation is stopped.